Water harvesting and use through open ponds, irrigation tanks and their networks form part of the well-known traditional water management systems in India. Thousands of such ponds and tanks exist even today, all over India. Several States in India recognized the importance of these water bodies in ecological balance, livelihoods of farmers and augmenting ground water resources and have been taking up renovation works in last decades. There are quite a few such initiatives in the erstwhile Andhra Pradesh as well, that restored the tanks, strengthened and augmented their storage capacities and attempted to enhance various livelihoods associated with such tank systems. ​Though silt removal from the bed of the tanks was done to augment the live and dead storages of the tanks in many such Government and NGO funded programs, it still remained a minor component in the entire work of tank renovation. Transporting the silt for application in the agricultural lands, on a massive scale and with the fullest participation of the farmers is not attempted in many of such initiatives. Given the inherent difficulties in organizing and bringing hundreds of unorganized farmers together around each irrigation tank or a pond, much of the efforts of tank renovations were on physical and functional improvements to the tank structures including its feeder channels and water distribution networks. 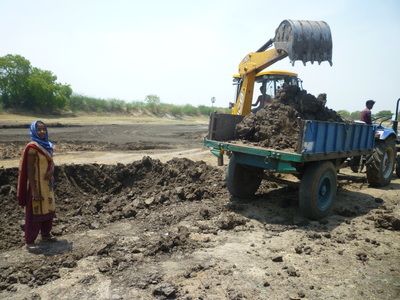 In the recently initiated Mission Kakatiya program of Government of Telangana, silt removal and application in agricultural lands is an important component. ​There are few successful experiences, such as that of SuGWM project in Telangana and Andhra Pradesh, in organizing farmers to voluntarily lift and transport the silt to their rain-fed agricultural lands. This experience demonstrated clear benefit in terms of increased storage capacities of the tanks, enhanced soil fertility, better crop productivity and incomes to farmers. The processes followed in mobilizing informal groups of farmers for this purpose and in systematically organizing the distribution through transparent monitoring processes, have insights that are useful to similar mainstream initiatives. This project captures these processes and tools as a research study. The research report will be useful for many civil society organizations, Government departments and other donors as a ready reference on best-practices in tank silt utilization. The analysis and documentation proposed will cover 10 irrigation tanks located in 6 gram panchayats.